Optics Trainer VR utilizes cutting edge virtual reality hardware for Vision Therapy and Vision Training. Our system consists of 12 activities designed to make visual and sensory training fun and immersive, while providing effective treatment and metrics. 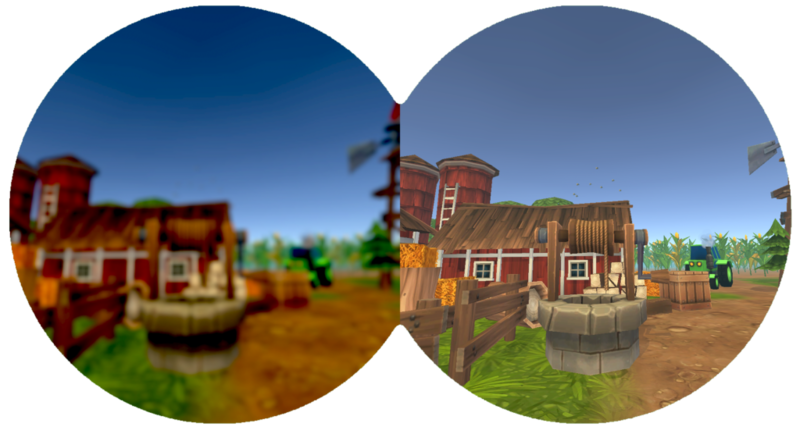 Each game allows customization for contrast and brightness for amblyopia, convergence and divergence for strabismus, and monocular fixation in binocular field. Our VR activities are designed to work on eye-hand coordination, reaction time, visual memory, visual discrimination, peripheral awareness, sports vision, pursuits, depth perception, vergences, and measure eye alignment. 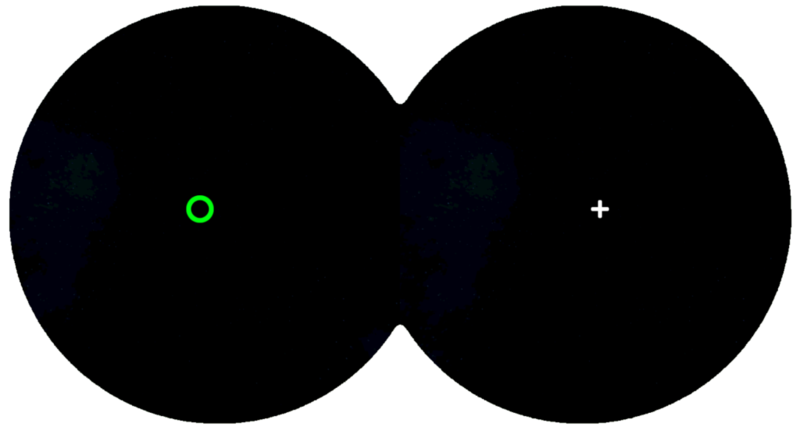 With our MFBF feature, you can set Right Eye or Left Eye dominance to place targets in amblyopic eye, and hidden from the secondary eye. This technique is similar to Red-Green Anaglyph glasses. With VR we are able to display a different image in each eye to promote anti-suppression and fusion. Our system allows for individual adjustment for contrast, brightness, and blur filter for each eye. This filter can be applied to the normal eye, while keeping the amblyopic eye unfiltered. As a result, we can stimulate the amblyopic eye, while keeping both eyes involved in the vision process. This is designed to make the amblyopic eye appreciate the details and improve clarity while both eyes are open. Practitioners have the ability to adjust the vertical and horizontal angles of strabismus (Base Up, Base Down, Base Left, Base Right). This allows you to change the target distance to where the strabismic eye is aiming, which allows for each eye’s central vision to be engaged and promote binocularity. Reduce the target distance over time to promote alignment. Practitioners also have the ability to adjust the torsional angle of the eye’s visual axis for cyclotropia. As opposed to the position of the eye with our strabismus settings, the angle of cyclotropia is adjusting the tilt of the eye on the visual axis (intorsion and extorsion), this allows more customized treatment for special cases. Our system has the ability to oscillate the patient’s angle of strabismus or cyclotropia over time in a smooth or jump motion. This technique requires the patient to actively engage their converge and diverge capabilities by constantly changing the vergence demand over time. This test measures the patient’s subjective angle of deviation in different fields of gaze. We place one unique target in each eye and measure the patient’s ability to align the images. The test presents these images at 3 varying depths (near, mid-range, far) to provide a comprehensive measurement of deviation. We have activities that focus on eye-hand coordination while simultaneously working on the patient’s ability to react quickly. Fruit Samurai and Ice Breaker are great exercises that present a stimuli and require a prompt response in order to succeed. Whether it’s chopping fruit or break ice cubes, patients young and old will enjoy how interactive and realistic the actions feel in virtual reality. Grid Shooter is an activity that tests the patient’s ability to memorize and recall patterns. We make visual memory exercises more immersive by creating fun visual environments and unique ways for patients to interact with the virtual world. Color Discrimination and Contrast Camouflage enhance your patient’s color and detail awareness. We make interactions more fun by allowing the patient to physically reach out, touch, and grab objects in the virtual world. For an activity that works both reaction and visual discrimination, pop all the balloons that have the matching target symbol in Precision Pop. Star Search is an fun way to actively engage the patient’s periphery. While using your central gaze to focus on the earth, use the peripheral vision to spot the stars around the earth and collect as many as you can. With Virtual Reality we can simulate realistic environments that look and feel like the real world. Bomb Boxing is a Go-No Go activity that puts you in a boxing ring where you need to turn and pay attention to your entire environment while punching the colors that match your gloves. In Ranger, we simulate realistic archery physics, even simulating the tension you feel when drawing back a bow. Test your speed and accuracy in both these sport activities. 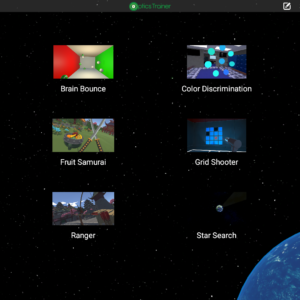 Brain Bounce is a multiple object tracking activity that requires soft focus, and visual memory succeed. The patient is presented multiple spheres and must remember the location of the target spheres as they bounce and move around the room. Tappy Bird is a fun way to work on depth perception. Tap the bird that is at a different depth from the rest in Odd-One-Out mode, or from closest to furthest in Near-To-Far mode. This activity can also be customized to work on depth at close range or depth at a distance up to 20 feet away. VR Headset with Controllers and Sensors. 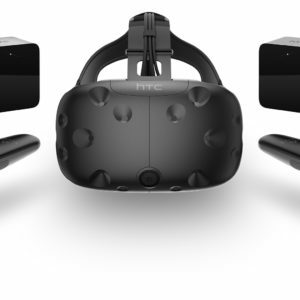 We ship our bundles with the HTC Vive, but you are welcome to request the Oculus Rift. 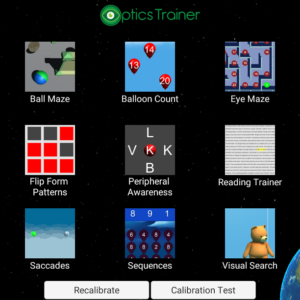 Optics Trainer VR Software and License. Our software license includes 3 years of free updates and bug fixes. Cost for expansion packs are included. No subscription or fees required after purchase. Pay for your Optics Trainer Software over 12 months with no additional fees. 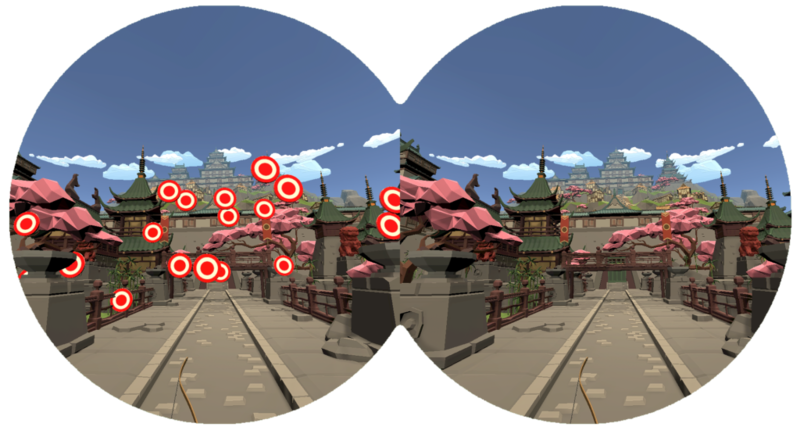 Get a free Home VR License with purchase of Optics Trainer VR Bundle or Optics Trainer VR Software. This is a great way to get familiar with our Home VR features and experience. Simply purchase your own Oculus GO headset and contact us for your license.